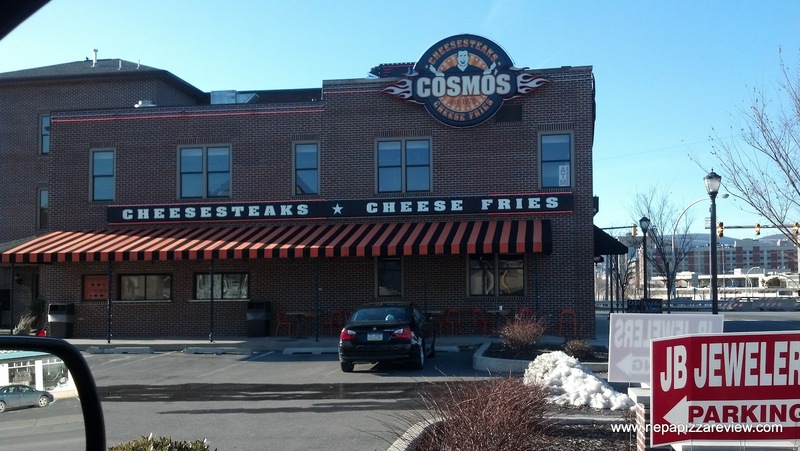 I received a tip from my guy that hits the streets of Scranton hard looking for the latest breaking pizza news in town who said that rumor had it that Cosmo's Cheesesteaks was developing a new pizza to sell to the masses. I immediately got excited because I've been a big fan of their cheesesteaks over the last few years and the potential of a pizza as good as their steaks was very intriguing to me. My guy ended up beating me to the punch and grabbing a pie first. For the record, he had nothing but good things to say about Cos's new pizza. UPDATE: I'm being told that Cosmo's is not currently selling pizza at this time. Check back for more! Although I respect his opinion, I'm the one who has to write the articles here, so I took a spin over to Scranton in the Pizza Mobile to try. Just a note before you head over, the bridge was recently damaged by Cosmos's so you sort of have to know where you are going depending on which direction you are traveling. It's not difficult to get there, but something to know beforehand. Anyway, when I arrived, the place really reminded me of a clean Geno's Philly Steaks in South Philadelphia with the outdoor dining setup and neon lights. There is also ample space to eat inside this spacious building. 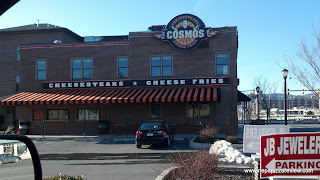 Check out my quick review of Cosmo's at Pizza570 to see more pics and rate it yourself! Since i was dining alone i decided to grab a small red pizza for $6.49. It was ready in less than 10 minutes so i wasn't waiting long. When the pie was delivered to my table i could immediately see what my buddy was so excited about. My first impression was Pizza Perfect meets Revello's - and by that i mean this pizza looked like a combination of Old Forge pizza and the Pan Fried Sicilian pizza which is found in the back mountain area of NEPA. 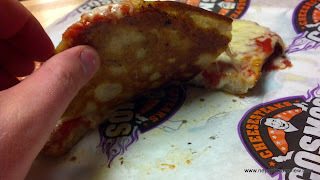 Specifically, the crust was rectangular and about the thickness of an Old Forge pizza at about 1/2 inch. The cheese was a blend consisting of mozzarella, and possibly a cheddar which was more like the Pan Fried Sicilian, but the defining feature of this pizza that is most like the Pan Fried Sicilian, is the fact that Cosmo's cooks the pizza with a semi-generous portion of oil under the crust for the deep fried effect. I will say, there isn't quite as much oil as a Victory Pig, and it isn't as thick, so this doesn't weigh you down like the Back Mountain pies do. While we are on the topic of the crust, I must say it was flavorful, tender, and easy to eat. It was crispy, especially around the edges, but probably could have used just another minute in the oven. The sauce was probably my favorite part because of the high quality of the tomatoes. The sheer simplicity of the vibrant and fresh crushed tomatoes with some light seasoning was an ever so perfect accent to the hearty crust and delicious cheese blend. 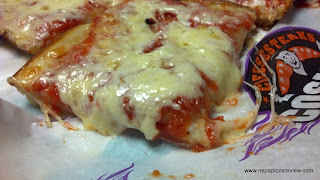 The contrasting flavors worked very well together throughout this pie, and I must say I very much enjoyed it, and to add to my enjoyment this pizza was something different and innovative which is something I love to see here in NEPA! As I finished my third slice of pizza and essentially was finishing up typing all of my review thoughts on my new Samsung Galaxy Note 10.1 , I had a very exciting first for the NEPA Pizza Review! Cosmo himself had come out to my table to ask how the pizza was and what I thought of it. I basically reviewed my notes with him, and he was super enthusiastic about hearing what I and the rest of the customers had to say about the new product. It was really refreshing to hear from a restaurant owner who really cares about his customers and his product. 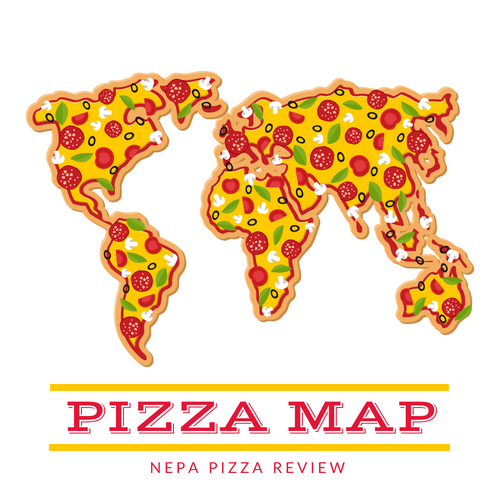 We ended up having a fantastic conversation about the business, but I will save that for another day, when I begin to publish my feature articles so check back for that exciting new product from the NEPA Pizza Review! Cosmo was awesome to talk with, and he was nice enough to let me try another of his new pizzas - the Chicken Bacon Ranch Pizza which is cooked on the same crust as the red pie, but with a whole different world on top. There is a tasty combination of creamy ranch dressing, chunks of marinated white meat chicken, freshly sliced in-house bacon, diced tomatoes and the cheese blend I mentioned above. I've had a similarly constructed slice at Rosario's, but this square pie took on a whole different life of it's own. You would think with this combination of ingredients, the slice would be salty and greasy, but i really found that it was neither (OK maybe a little greasy, but not at all excessive). 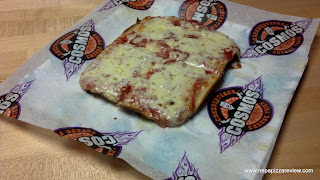 I won't give away Cosmo's secret, but the signature browned edge on the crust had an incredible flavor and a crunch-factor that was second to none. Because I have to be honest with my readers, the Chicken Ranch slice was on the house, so I will not be rating that slice by the numbers because I don't want to have a conflict of interest. However, I do stand by the ratings on the red pizza, and I do strongly recommend that you try Cosmo's new line of pizzas soon! If you enjoy Old Forge Pizza and Pan Fried Sicilian Pizza, do yourself a favor and give this pizza a try because I haven't found anything quite like it anywhere. Another great review here, with good pics. I concur that the crust looks wonderful, but the cheese, well, looks overloaded and undercooked. That looks like a pie that could go to another level if it has 1/3 less cheese and 2 minutes under the broiler to get some nice browning on top. But it looks like a good pie even with its flaws. CCPG you have quite the eye for pizza. I agree with your assessment, but I contend that there was just enough cheese to balance the whole pie out. You are correct that if it were browned up just a smidge, this pizza could have been off the charts. Thanks for the comment, I always appreciate your input!